Tuning for Speed should be on the top 10 list of just about everyone’s motorcycle classic book list and has been called “one of the best books ever written on the improvement of motorcycle engines”. Phil Irving was a brilliant designer and engineer, but he also had a wonderful ability for communicating this knowledge to others. Among his many credits are his contributions as Chief Engineer for one of the most desired classic motorcycles of all time, the pre-World War II Vincent-H.R.D. models. He also designed the Velocette adjustable rear suspension system and the stressed steel frame, the basic design of which is still used in motorcycles today, and he has written several books on the design and tuning of engines. 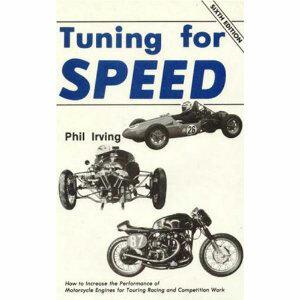 Tuning for Speed is “how to” manual for those engines, carburetors and drive trains of old, but the theory and engineering is as sound as ever. It is few of long-lost tricks and techniques that can be applied to today’s power plants. Irving’s explanations of how things work are like a short course in mechanical engineering.